Gerald Amazing things are happening to me! I am super positive and I just won a lot of money and a new range rover. Two days ago I got a written offer for my house I am wanting to sell $-) and lots of other things are going smooth now. Even little things that make my life much easier. I am having so much fun!!! I am healing too! Healing and Super healing…..I tell myself I have already healed and now I am SUPER healing. Saying that works for me 🙂 I am so excited! I am going to use some of the proceeds to a tree planting project or start the tree planting project myself. We all need more trees in our life to clean up the air. How wonderful!! Inner cleansing of PTSS and reaching higher levels of inner peace. High success rate at predicting the results of horse races. Getting downloads of information about information about people she meets or situations across time/space. Very important comment about the need to train with BOTH RV and RI as she witnesses many highly skilled RVers succumbing to a pitfall when they successfully foresee situations (RV) but fail to apply Remote Influencing skills (manifesting skills) to influence and change situations that surround them and henceforth get paralyzed in a spiral of fear and pure gloom and doom. MANY MANY THANKS for your contribution to humanity. You are a most generous individual. First allow me to say that I have had post-traumatic stress for quite a while now and I have been completely determined to master your course. It has taken some time for anxiety levels to quiet down, but now that they are subsiding, I am getting results thick and fast! I started RV-ing about a week and a half ago to see if I could get some RV *results*. I can only assume that because I did not trust my ability at first (I was in awe of my initial results! ), (no trust = fear), and probably accounts for the ones where I bombed out. I can now see that fear will never give way to any results – because fear carries very high frequencies and does not allow access to the slow Theta/Delta brainwaves required to access information. I have not even used associated remote viewing, which is what you recommend Gerald. The numbers are coming up in the exact order sometimes. On Friday I asked for a high paying trifecta (first 3 horses). Three numbers came up and I did not know for which race they were. I am looking forward to having more trust and peace in my life and applying RV and RI techniques for the benefit of my friends and family. I am also getting access to information about people and places. Sometimes it comes to me very subtly. Sometimes I know things about people who I have just met. I am now sure that in the coming weeks and months that I will be having more and more success the more I practice my trust and surrender, focus and intent, accessing theta and delta! It is my personal recommendation also that you do invest in both the RV and RI courses. The reason for this is that you need to keep the loop going between theta (RV – view) and delta (RI – create). Why? Because you need to be able to reject the matrix and impose upon it – and create! 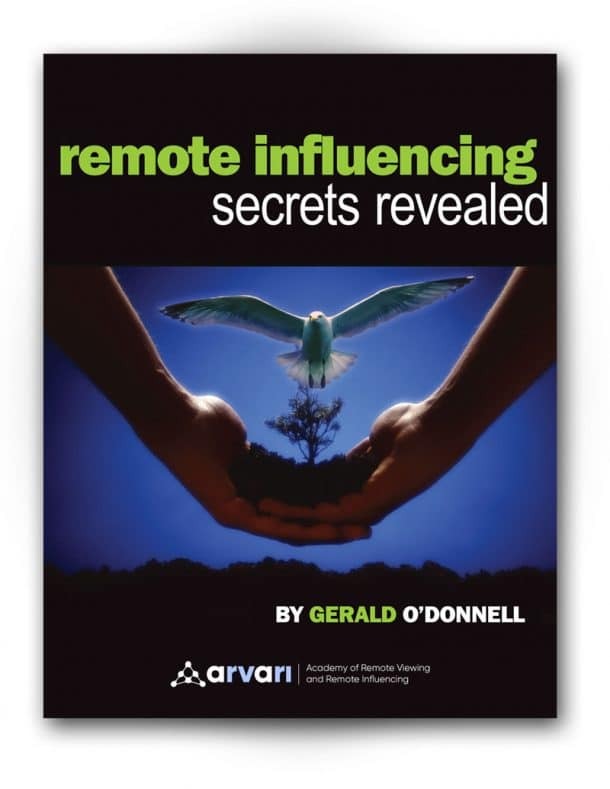 I know a few naturally gifted remote viewers who do not practice remote influencing. Hypercritical and fearful of what they see, it leaves them paralyzed with fear, unable to create! So potent are their RV abilities that they create using their fears and I have seen them ending up with disastrous results! Gerald, thank you, thank you, thank you for showing me how to access the abilities and happiness I once had as a child, which I thought were lost forever! Simon Hunt Shunt578@gmail.com a recent RV/RI Combo trainee sends us this new feedback on November 28, 2007. Applying his Remote Influencing skills in a casino and getting immediate successful feedback by winning 6 times out of 6! I actually see the woman coming to the machine to pay me in my mind. It has been the same lady for 5 of the times. She is more amazed then I am about it. She told me that it is a 1 in 40,000 shot. Last time she paid me she said “GOD sure must love you.” I responded that “INDEED HE DOES!” Of course I always tip her well and I have given a lot of the money away. I actually never have been one to get all excited about money and the less I think about the need of it the more it always comes into my life. I thought you might be interested in hearing that bit of news and other students of yours might be too! I am definitely not suggesting that anyone take up gambling. Gambling suggests need and when a person plays in need, they will usually lose unless they get lucky. And never depend on luck. If there is the SLIGHTEST bit of doubt then never do it and if you just cant help yourself and feel you must do something, whatever that something might be, then most definitely don’t do it. When in doubt about doing something DON’T DO IT and if you feel pressured to make a decision. DO NOTHING! The correct thing do will come to you. The natural (carnal) mind will ALWAYS make the wrong choice. Chris Podlewski michigander_@hotmail.com writes to us on July 11, 2003 this feedback. I am about to purchase the Remote Influencing Course and would like to share some experiences. As a background, I purchased the Remote Viewing Course some time back (a few years ago). I struggled with Remote Viewing somehow as I am a very analytical person. I had no problem getting to the Theta state. My problems involved trying too hard to imagine what I should be imagining (vibratory light and the like). Also, I tended to try and analyze any image that might try to come. Despite this, my intuition did increase greatly. I am very mathematical so I never thought intuition really existed. I noticed my intuition didn’t seem to be as good as before. Late last year I started listening to the tapes again and read the information that came with them again and decided I was trying too hard before. Too shorten the story some, I wouldn’t put effort into trying to visualize anything and would just relax and listen which helped. My intuition came back and I’ve had positive experiences while meditating with the tapes although I still don’t get many images that I understand. Although I suspect that relates to me not really being interested in target practice. I am more interested in improving myself anyway I can and learning whatever I can. It has now gotten to the point that I have listened to the tapes many times and I think it is time to move on to the Remote Influencing Course which actually sounds to be of more interest to me than the Remote Viewing Course which has been helpful. Influencing Course could put people on the path to achieving. Thanks for the Remote Viewing Course Gerald and sorry for the long message. Tracy Sack sacktrades@aol.com sent us this feedback on June 10, 2003 after taking our RV/RI course. Opening the door to one’s subconscious realm. Tracy has won a couple of 3 number lotteries using RV techniques. P.S. Tracy has asked us to post that he will not reveal yet his method and will not answer inquiries on the subject of lotteries until he decides to go public with his method. So please refrain from Emailing him about this. When I use the methods from your remote viewing course, I now can focus to retrieve data I am viewing while in the theta state of mind. I recommend any person to try this course if you have never experienced what a altered state is naturally. The first audio tape I listened to was a vivid dream-like state where my conscious thoughts could still operate. This course taught me many intimate sides and capabilities of my mind I have not known from any other source of learning. I also built a foundation of knowledge to construct the ideas of other remote viewing techniques and remote influencing techniques which came later. If a person allows their unconscious to listen to this course, a different world will be perceived for sure. It can’t be otherwise. Thank you Gerald. I have included a Lottery Paper I wrote about my experience with a formula to decode time (I guess). Please don’t post it. I just wanted to share it with you, and if it continues to be successful I will post it on Grillflame to share with others. If you have learned any thing about the formula yourself, please e-mail me with your data. I am very pleased to share my experiences with Remote Viewing and Remote Influencing . I started the course in March 2002. After practicing 2A and 2B lessons for a short time, I was able to drop down to Theta rapidly. 1. I was able to remote view world events, like troop movements. I saw the transfer of troops within certain countries. I also saw missile tests taking place in Pakistan. 2. I was able to tune into three airplane crashes. I later learned from news report that I foresaw these terrible events a few days before they actually happened. For example, in one scene I saw the Chinese character “North” on an airplane. Later, I read in the news that the Chinese airplane Northern Airline had crashed in Korea. 3. I was able to scan books with my hands before buying them, and I got strong impressions of which books would have a special message for me or benefit me the most. 4. I have used remote viewing to help my friends find solutions to their problems. 5. I was able to scan health problems like specific areas of the internal organs in a patient. These were later confirmed by medical tests. For example, I saw a dark patch on my father lung. This was later confirmed by X-ray. My father was a smoker. My father lived in China and was bed ridden. After I applied RI healing on him, he was able to walk again and come to visit me in Hong Kong. By the way, with the healing energy he even grew a new tooth -the 3rd set. This surprised the doctor. 6. I could pick up an energy grid in a healer’s energy field. This healer was really shocked as no one was able to “see” the secret grid placed by his master for psychic protection. 7. When I dropped down to my levels, I picked up winning lottery numbers and winning horse numbers. This happened without my willing it. I passed these numbers to my friends who then had success with winning both horse races and lottery entries. 8. Finally, I have used remote viewing to forecast the stock market. Patricia Brooks, ( rnpilot@hawaiian.net ) a new trainee living in New Zealand send us the following feedback on January 11, 2002. Just wanted to share with you one of my first successes. Although I ordered the course in August, I moved to New Zealand and the mail didn’t forward my tapes till the end of Oct. Since NZ has a lot of horse racing and results are available on the internet, I decided to use the races for targets. Yesterday, I correctly identified a winner. I’d tried doing 2 other races in early Dec. without success, but wasn’t finished with the course at the time. This was my first target attempt since finishing all the tapes. It was really thrilling to find out I’d been successful. I’m excited to receive the RI tapes and continue learning. Thanks for a great course! David Schoen ( DSchoen730@aol.com) a former trainee writes to us on March 10, 1999. Applying our RV course to intuit and win at the lottery. I would like to tell you something that has been going on with my remote viewing and I would like to share it with you. I love to play the lottery and I have noticed that I have been winning more and more using a lot of different remote viewing methods originating from your course.. I have won the ” pick 3″ five times since I started trying to do it this way. I don’t usually win more than 2 times per year and now I have won 5 times in a few months. I hope you don’t mind my sharing this with you but I just had to tell you once again that I thank you for this great course. You have really been an inspiration to me. The things that your course has done for me are to numerous to even list. I couldn’t be happier. This course is more than I hoped for. I have started to write stories and poetry. This is not what I have ever done in the past. I have had friends from all over the world check my results and they have caused quite a stir. To check my accuracy I have been playing cash 3 in Kentucky. I have gotten them right once and most of the time I get 2 out of three. Not bad for a novice! When I go into the future, the people that I talk to have a mind of their own. This was a real shock. Have you ridden a Harley Davidson in the year 2020? I have! I will share with you, for now, how I am getting the Lotto numbers. John C. ( mcse_98@hotmail.com ) writes to us on January 04, 1999 this feedback. I have no idea if you remember me. Back in the summer, I was a contest winner, and received the six-tape course as a prize. I dove right into it. I had been doing a lot of ARV (though I didn’t know that was the term for it) already with regard to lotteries, and I immediately began to work through your tapes. When I got to tape 2a, I was floored. The first time I did it I was practically in tears, the sensations were so marvellous. The second time I did 2a, I stopped at the Deep Theta room & did my ARV work for a local Pick3 lottery I had just started working with (this was the fifth time I tried to do it at all via ARV, and the first or second time using your tapes). There were 3 numbers to pick, with 10 possible values for each. A one in a thousand shot for the jackpot. I nailed it. I was ecstatic. $511.20 for a one dollar ticket. Somehow, though, I started to drift from the tapes. I bought into the political “talk” of a number of prominent RVers, and got sucked into the polarizing world of “this RV camp versus the other RV camp”. It has taken me several months to realize how foolish I was in swallowing all this partisan nonsense. In the last few weeks, I have realized that I need to get some sort of training. I have read the on-line CRV manual, the SRV manual, and have picked the brains of students of a number of schools of RV… all trying to find a course that I can do. Last night, I was talking on an Internet Relay Chat with a person (Graig) I’d met on another RV group’s website recently. He told me about this great fellow he was working with who had been involved in a European RV intelligence unit. I suddenly remembered the Probable Future tapes in my file cabinet, and felt like an idiot. I really want to apologize for having been so easily sidetracked from your generous offer of the free course materials (via the contest). I guess I was just so new to RV that I assumed one could simply trust most of the people involved to be objective in their assessment of other “schools of thought”. I realize now that it’s a very political arena, and everything everyone says needs to be taken with a grain of salt. So I’m back. I’m going to begin working through the tapes again (I never did get past 2a), and I’m hopeful that your previous offer of support along the way still stands. Anyway, I’ll cut this short. I just wanted to let you know that I’m looking forward to working through the materials, and hopefully talking further with you. Joseph Kenney ( dkjen4@aol.com ), one of our RV trainees, wrote to us on March 2, 1998 the following comments. I would like to drop you a line to update you on my progress. I still have not chewed smokeless tobacco since January 10, 1998, and have no cravings for it whatsoever. Another RV experience I recently had happened in Atlantic city where I won some money. The way I went about it was as follows: Prior to entering the casino I would ask myself if, upon entering the establishment, I would leave it with more money than I entered it with. If the answer received was Yes, I went in. If No, I would not. Out of 10 sessions where Yes occurred, I won in eight of them decent financial gains. I also have been using a similar RV technique for trading the commodities futures markets. I look at a simple bar chart and then ask myself in which direction the markets are going to go. An answer then appears mentally, either saying up or down. I then simply buy or sell based on the response. This method has also been correct 70% to 80% of the time. I must mention that my trading time frame is anywhere from 20 minutes to 1 day ahead. Your other students that trade should try this approach. I would like their thoughts on this. Peter peter@titan-developmentgroup.com wrote to us this enthusiastic feedback on February 20, 2012. I purchased the remote influencing system about a 10 months ago. I was really at rock bottom in my life both personally and financially. I had been divorced a year before, estranged from my young children and flat broke with poor job prospects. 10 months later things are looking very, very different. Joshua Lorne joshua.lorne@gmail.com sent us this very important feedback on November 24, 2010 where he shares deep insight into why our Manifestation approach is really a “Quantum Prayer” as he puts it, as you become cocooned in the warm Presence of the One while in Deep Theta or Delta and that nothing can then avoid the manifestation of your silent yearning, for the key is to be in the permanent embrace of that connection. For the past few months I have concentrated my theta and delta state meditations on repeatedly requesting my professional situation to shift for the better. It did not take long. I asked The One to enable me to work less yet have more income. The result: my hours have been reduced and my income has gone up considerably. I have not had to extol as much effort as I did prior to achieve the same results and have been able to dedicate more time and energy to my own evolution…. I went from being an extra on the set of feature film “CONTAGION” to a Principal Actor in 24 HOURS! My character says lines to Bryan Cranston and Laurence Fishburne responds! As soon as I can afford the system, I am BUYING IT! Finding peace within and letting go of old anger/fear. Business relationships and money flow improving. I want to thank you for making this course available. I’ve been dealing with anger ( hot temperateness ) for as long as I can remember. Since buying your course a few months ago I feel much more relaxed and don’t take things so seriously. Business relationships have improved and money is flowing better. Problems are no longer what I thought they used to be, and I feel like I’m just getting started. I’m now looking forward to even more improvement and happier life. Manifesting successful job interviews following our RI advices. Hi. This is Carrie Voss from Boise. We spoke last week on the phone and you gave me some great advice regarding job interview preparation. I just wanted to let you know that I had an important interview on Monday at Intermountain Gas here in Boise, and it went very well. I got a callback for another interview for today at 4pm. I’m totally confident that it will go just as well, thanks to your advice. I just wanted to thank you again. Increased Inner peace and Joy. Creating the life he desires. Medical practice, career etc.. is booming. Using RI to successfully heal difficult cases. My life in this universe (and probably others as well) has been an amazing journey since I discovered the RV & RI. I have completed the combined course and I repeat various exercises. Every day brings new excitement; I cannot describe with words the confidence I have for every single thing that happens because I know that I am creating the life I want around me. My carrier is rocketing, my practice is booming and my life is more fulfilling. You may have noticed that I am a surgeon. Lately, I have healed 2 problematic cases. The healing was so good, the outcome unbelievable. Due to human nature, even though I could actually see in my mind the end result, there were times I had doubts which I was trying to delete from my thought. But the final results were mind blowing!!! Now I have much more confidence and next time around I am sure it will be even better. Most of the times lately (if not always) when I need advice or solutions, I find that when I stop thinking about the problem and my mind is calm, somehow I get answers, most of the time without even doing an exercise. Jewel Durovy-Meeker durovymeeker@yahoo.com writes to us on April 10, 2006.
accelerated healing of a broken bone. Life guidance using Remote Viewing. Increase in self-confidence by knowing that she can Remote Influence any situation and is in full-control of her life. Acknowledging that the Academy had managed the feat of putting the very core of multi-disciplinary modern and ancient mind/spirit technologies into useable practical courses. I am writing this with deep gratitude for the changes in my life that your courses have provided. Within the first few tapes I had more understanding of the truth that surrounded me. I have proof of tremendously accelerated healing of my own fractured bone, I experience visions that lead me to make life-changing profitable decisions and my self-confidence has never been higher. I know that I have the ability to change any and every situation in my life. Most importantly, every aspect of my existence has been transformed into a very deep spiritual awareness. I have been reading an average of 3/4 of a book a day on vibrational medicine, spiritual enlightenment, reiki, hypnotherapy; pretty much anything I can get my hands on. So, to my point… Out of all of the books and websites I have studied you have accomplished to extract all of the important information and package it into such a useable and versatile tool. I still hit that state of awe after reading 350 pages and it comes down to you having summed up into a few key phrases within the course. I also want to thank you for your support in answering my questions about the courses. I was impressed to find a business that still deals with the customers personally. I had expected to purchase this and be left in the cold. You truly are a remarkable man with a remarkable product. I would be happy to talk to anyone personally having doubts of purchasing your course. Pacomo, fslavik@sbcglobal.net , a recent Remote Influencing/Remote viewing trainee sent us this thankful testimonial on September 26, 2005. I have completed your RV course and want to describe my progress. I have experienced the out of body experience, have gone to both the past and future, have experienced increased intuition, and ability to merge with both the animate and inanimate, as well as, some ability to communicate while merged. I have been getting more solutions and instructions for my business affairs during my sleep. In addition, I have been able to RV and pick 1 to 3 of the finishers of horse races in 3/4 of races and in maybe 1 out of 10 races I have RVed all 3 in order of finish, however, that is not enough to make money at it. One of the greatest benefits came from your explanation that “visualizing” was the same as “daydreaming”. For over 30 years I have been frustrated by my lack of visualizing ability. I have asked all that I could find who taught visualization and it was not until I came across your description that it worked for me. That removed the major block to my perfecting many skills. In addition to thanking you for making the RV course available, I want to thank you for your willingness to set up a time for coaching calls, this has provided the invaluable fine tuning. Just a note to let you know that I started the combined RV/RI course in October 2004 and the journey has been amazing and joyful. I feel like a chesser cat sometimes when I walk around on my way to or from work or running errands, etc, with a wide grin on my face and my body spasmodic with pleasure of experiencing a heart that’s wide open!! Watching/feeling people and animals and plants as part of the ONE, part of myself, is just….. I have no words for it except “bliss-full” Ha-ha! I’m nearing the completion of the course(s) and getting ready to start over on the 2nd run and see what adventures I experience! A couples of experiences I’d like to share (out of many) is that around the second week of starting the course, I was listening to the CD while in bed and I “woke up” and I saw that I was no longer within the walls of my apartment, I was in the midst of a cobalt blue sky or universe full of stars and a face kind of “engraved” in the sky (it was my face and the face of the “One” all together!!! I was not in the room!! Ha. And another time when I did a session outside among the trees and foliage…. wow! the response from the birds around me was amazing! The crows, I’ve never seen so many crows surrounding me/the area. And they seem to be welcoming me or congratulating me, they were so excited. A hawk left a gift for me (a nest-building twig from a tree), etc. WOW! is the word of the day! My musical career seems to be taking off as well in ways that are mind-boggling as well. I must say that I truly feel Joy 98% of the time and working on the other 2%. My body feels like an electrical circuit too! A real live wire! More later. Thank you Gerald! Manuel Madrid Judgedrid@aol.com rote to us this testimonial on July 05, 2004. I want to report that I have a better control of my life and I am looking forward to every day’s challenges ,which are miniscule in comparison to the big picture of life that I received with the help of my new found gifts provided by the Academy and Dr. O’Donnell. I seem to be better at everything that I do . People marvel at how I know what they where thinking and this is only after listening to the tapes for 3-4 months. My team that I coordinate is up over 149 % in sales! So far, from Jan. to 7/2/04, we did in sales what took us all of last year! Also in April of 04 we did in one month what took us 6 month to do in sales last year !!! This is unbelievable !!! I am contemplating this for a while and I realize that I really am not killing myself doing this. I guess it is the mental will or my perceptions becoming reality, which is more comforting than fearing life or just playing things safe or rolling over and letting life crush me. I have been controlling my negativities because I have seen them become reality also. I am very happy with the results so far and I feel that I will get only better results not only for myself but for all of Mankind where we could live in harmony, love, and peace. I look forward to this and it is in my prayers every day!!! Please call me when possible !!! I have one question and that is: could my son of 11 years old listen to the courses? Pam Slayton Pmantares@aol.com sent us this feedback on Jun 10, 2004. Rob Rob4061410@Yahoo.com a recent trainee, wrote to us on March 08, 2004. Remote influencing a situation at work. I first started using your techniques while I was with my former band. And yes, i did notice that immediate progress was being felt. Several deals came through, including a very rare chance to record at Sony Studios in NYC, which many band’s in my situation could never afford, nor would the door be opened for them to record at such a high-end studio. However we did get in. My drummer had been playing in a side project, and asked if I (bass guitar player) wanted to play with the side project. I did, and was immediately accepted as the permanent bassist for this second band. Soon the drummer and I came to a decision that this side project really should be the main focus, and we cut our old band loose, the same band that I had been using your RI techniques to enhance. I then realized that it wasn’t “my band” that I was aiming success for, I really was RI’ing success for myself in the music industry. This reality of success is materializing in a way I did not originally intend. Now my old band, perhaps the other guys may find success elsewhere in the industry, but me and the drummer are going places with this new band, and going places fast! So I know now that your RI techniques worked, not only faster than I imagined, but not at all as I imagined. I’m in a completely different band, and in a place that I could not imagine only 6 months ago. Paul G. arvthetaman@yahoo.com wrote on January 4, 2004. “Artist block” completely removed while taking the Combo course. We spoke on the phone a few times and I wrote to you a few weeks ago concerning the miraculous results I had when starting your course(s) and although I am only about halfway through I would like to report another happy update. Those that know me personally know that creativity is one of the most important things in my life. I have composed and written music for the past 17 years and started to develop pretty decent skill in the visual arts as well about 7 or 8 years ago. Although I got off to what many people said a great start, I have had a serious case of “artist block” for several years. So much that I couldn’t even lift a pencil, and it even hurt (go figure) to even look at fine art. I started using tape 4A of the RV course where you go back in time (perceptually, of course, but it sure seemed real to me). The second time I used it I was guided back to England around the 17th century and I was being guided by the “light” that you speak of to look at some of the ornate artwork in one of the palaces. It sure was a sight to behold. After finishing, I felt absolutely wonderful, but thought no more of it. Well, yesterday I went to a local Barnes & Noble bookstore and went promptly to the art section where I was guided to two art books that had just the right information I needed to break through my artist block and start again. Last night I actually drew for about 2 ½ hours – the first time in several years! And it felt wonderful! The artist’s block seems to have been dislodged, and I’m sure it’s not too long from dissolving completely if not gone now. As with my previous email which you posted this happy occurrence is a BYPRODUCT of using your courses and is NOT the intention! If I would have known before starting or even learning about your courses that I would 1) heal a major medical condition and 2) break through artists block, you could have charged millions and I would have mined gold if I had to. It certainly is a testimony to you and your guiding “light” that is making this information available for the ridiculously low price that you charge. Again, as I wrote in my previous email, if this is any indication of what’s to come after using only half the course(s), then, as our beloved Keanu Reeves would so eloquently say – whoa! Oh, and I am much more happy, peaceful, and stress-free, too. Does that count as a third “happy byproduct”? I hope you have a wonderful 2004 and beyond. Thanks for posting all of your testimonials. Reading them really gave me a lot of hope when I had very little. Therefore, feel free to post mine to give anyone else reading them additional input. By the way, I have tried many, many things (courses, programs, workshops, etc) over the past 15 years, and being very psychically sensitive, one or two of them had horrific results. I can say that yours without a doubt, is the safest program I’ve ever seen for developing your inner mind, expanding psychically, and learning to increase, control, and project your energy. A lot of the problems I have had regarding being “open” have now been completely solved by using your tapes…another happy byproduct. Many more happy days to come! Tome Berry ( teberry@attglobal.net) writes to us on February 17, 2000 this testimonial. Creating a better reality using the deep theta state of mind. I am a contract programmer and I have not been getting as much work as I would like. When I heard about your Remote Viewing course, I wasn’t sure that I could fit the cost into my budget. I am very happy that I took the chance. After going through the tapes and using the techniques I learned, I now have more business than I can handle. Now that’s a great feeling ! It would be really easy to say that the surge in my business was coincidental, but I think there is a definite correlation. When listening to the tapes, I have found that sitting in a recliner in the mid afternoon works best for me. That way I don’t fall asleep but I’m still very comfortable. I am lucky that I work at home and can take a break in the afternoon to listen to the tapes. THANK YOU for making the Remote Viewing course available. H.J. Miller ( willow@atl.mindsprings.com ), a recent graduate, wrote to us on April 30, 1998. His remarkable experience of the Great Self, and his merging with the non/space time reality while keeping his eyes opened. He also addresses business trend forecasting applications of Remote Viewing, and remote site viewing for business use. As a long-time and high-level trainee of the Monroe Institute, he favorably compares our methodology and results to their advanced Gateway protocols (Out of Body Experience). First and foremost – THANK YOU for generously making available the Remote Viewing course. I can only define it with one word WOW!! and, as “Tony the Tiger” in that cereal commercial would come to say Grreeaat…. As a practitioner of the Monroe Hemisync Gateway protocol, your tapes have developed for me a surprisingly easy way to reach Theta 4/ Delta 2 and I would like to remark a bit on the comparison of the two systems. Robert Monroe developed what is called a “binaural” beat, that is, transmitting one tonal frequency in the right ear and a totally different tonal frequency in the left ear. The brain in trying to decode these two tones would, Monroe discovered, generate a THIRD distinct tonal frequency that unlocked a variety of mind experiences. These are called “Focuses” and, in providing some sort of definition for them I’ll provide a brief idea as to what the main focus points do. (There exist lower numbers but, we’ll concentrate on those higher ones that are parallel to generating the Theta/Delta state). Focus 15 – is a state of “no-time” in which one explores beyond the constraints of time and space. In effect, a form of communion with the higher self. Focus 21 – is a multifunction state as it first develops a separation of mind-consciousness from the physical reality. Second, alike Delta (sleep), this is a “mind-awake”, “body-asleep” bi-location activity enhancer, that projects the consciousness into an “out-of-body” state (OBE). I have been an “Explorer” (as we were then called) since the early 1970’s where, in those days we really didn’t get far until Bob stumbled across an extremely simply key, that unlocked the “Gate” to allow exploration. The key was “Affirmations”. It seems that when one reflected with an affirmation of protection and pleading for knowledge and insight, the entire aspect of Creation opened and one became “conscious of the cosmic” (Cosmic Consciousness). So how does the Monroe Gateway parallel your Remote Viewing tapes? Firstly, you have developed a decidedly “simpler” methodology and, your technique of mind expansion is extraordinarily effective. Your use of the background tones (music) helps initiate a relation that causes the physical senses of the body into being “fooled” into a deep relaxed state which allows the mind to slip into Theta 1 which is the first Gate. The technique is extremely easy and, as said, extraordinarily simple. This I found to be practical and totally enjoyable. So what of the experiences that I’ve undertaken? I appear to have, through using your tapes, moved into an extremely profound Theta 4 / Delta 2 in which I experience an irradiant blackness (“Blackness Visible”). Here, in this state of awareness, is the most profound Silence possible. Yet, it is here, that there is loss of words to describe the experience. I believe that when we spoke on the telephone, it took me over five minutes just to introduce it. I felt that “IF” I had moved either left of right,, I would have had total physical absorption – such as that experienced by the ancient Rishi or yogi. “gift” that is there for all who venture that way. It was beyond being profound. It was total, complete absorption of the id, the individual identification of self. You warn of this state at the very beginning of the course and yet, this appears to be a natural gravitation. We (my business partner and I) purchased your course to aide us in our venture, and believe me it has gone way beyond expectation. In all, the general experience of being able to Remote View our business is pronounced. My partner using your tapes, has developed the same R.V. alpha/numeric abilities that I have and can literally read files thousands of miles away. This is but a small indicator of just how powerful your RV technique is. We can project or forecast trends and activities to a resounding 81% which gives us an extremely decided advantage in dealing with our business affairs. I’ve had, as said in our earlier conversation, a number of remarkable experiences, one being in a T3/ D1 state and being able to roll my eyes down (at this stage one’s eyes are usually rolled up into the eye socket towards the forehead) and actually open the eyelids and look at my surrounds . The head and body were rigid, and felt cool, breathing was shallow, perhaps 3-5 breaths a minute. I didn’t pay attention to my heart rate but was more than amazed that I was able to do it, to say the least. This lasted, it appeared, an “eternity” (no-time awareness). But, this experience was well remembered by me, as I had been able to see the clock radio and mentally note the time. The sensation was totally different than an O.B.E. There was no bi-location being expressed, there was a physical union of mind and body but with a total absence of sound. It was similar to a “waking dream” but, again, it wasn’t,, because of the dynamics of earlier experiences that I’ve been through. I realize that I’ve been doing Theta 4/ Delta 2 since at least 1974/75 so I have been exposed to almost a Quarter Century (24 years) of exploration in these altered states of consciousness of what would generally be considered “remote viewing” via the Monroe Gateway protocol. So then, what was this earlier extraordinary experience of being in that “irradiant blackness”? In all actuality I believe that it was that profound “nothingness” that is the Self that which is called by all: “me, myself and I” – our personal expression of what one would refer to as being “God”. So then, where does one go from here ? For one, I would like even more suggestions and input as to your methodology, especially to establish written protocols to enable better control and feedback. I would heartily endorse the course to anyone who is emotionally stable and not taking mind altering chemicals. Although I have years of OBE and Theta 4/ Delta 2 exploration, I know that it works well since my business partner who was green behind the ears in this, is able to Remote View alpha/numerically effectively using your tapes. Again Thank you so much for providing the tapes. Munjal Patel, MUNJAL6100@HOTMAIL.COM , a dear student from India, sent us this very nice and enlightening feedback on November 22, 2011. Krisztian Panthera public@christianpanthera.hu a combination RV/RI course trainee from Hungary, and national TV star (host of a famous Paranormal show) sent us this feedback on November 12, 2009. Seeing successfully after an RV session, the day trading intra day chart for the next day. I am very happy to have gotten your courses. I started studying it. I have already had a very positive experience. I heard the theta or delta CD, and saw yesterday a picture about my day trading chart for today. I saw the exact values on the chart. There was a big different from yesterday’s chart (17 points). Today in the afternoon the market reached exactly that value! I am very excited ! Maria Jaber mariawj@yahoo.com sent us this feedback on October 19, 2009. Clark Berger clarkberger@hotmail.com sent us this feedback on October 8, 2009. Taking advantage of our 2008 prediction of a proximate steep rise in Gold prices (BTW we foresaw a gigantic price increase in Gold prices since the end of 1999 when Gold metal prices hovered around $225 together with a worldwide Stocks and real estate bubbles implosions. We stated then that the stocks market had completed their all time peak in real value on 1/1/2000). Just wanted to thank you for the tip on gold that you gave on your website and an interview last year. I invested all my savings and it has enabled me to weather the economic downturn, buy myself neuro-feedback equipment (IBVA Mac compatible- Highly recommended) and above all your course has led me to a happier and more purpose filled life. Shelly and Scott Duncan, shellyd@iprimus.com.au, from Australia, are past trainees of both our Remote Viewing and Remote Influencing courses. I have done extremely well in my precious metals investments over the past years, thanks to you advice and my RV and RI abilities. In many cases my investment decisions are based on reviewing the business plans of a number of companies and then I short list them on the basis of my feelings to determine whether I should make the investment or not. I do not like day trading, but prefer to invest in companies which I am happy to hold for between 6 months to 2 years. In most cases these companies have generally started out as small low cap penny stocks and over time emerged into medium sized companies. When reviewing potential opportunities, some just have a particular feel to them, much like when you hit a golf ball in the sweet spot of the wood and it has a kind of perfect feel to it. A number of the companies I have invested in are small precious metals companies, and I can recall when I first started the course and spoke to you, you had mentioned that gold had a big future and it was only $280.00 US back in 2001. It was hard to believe back then, it almost sounded insane. It has now gone over $700.00 US but has pulled back a bit over the last couple of weeks. Eric Chris Molly Cole ericandchristy@yahoo.com a recent Remote Viewing and Remote Influencing trainee wrote to us this feedback on April 15, 2006. Getting better at “pulling the trigger,” and following trading rules while trading Stock Indexes. Getting 9 winning trades out of ten since starting the course. I just recently ordered your Combination RV/RI courses and I am about halfway through it for the first time. I like your course very much and I can that tell my brain is acting differently. I have about a 20 min commute every day to and from work and while I am driving I normally state affirmations like “I am a great trader and I follow all of my trading rules” (I trade futures with a strict set of rules) and I have noticed that I can follow my rules much better now and I have also only had 1 losing trade out of 10 since I started your course. When I do get in a trade I normally say something to like ” the Dow Jones future has already hit my profit target”. The one trade that was a loss hit my stop loss point but later in the day it did actually hit my profit target! Anyway I can’t wait to finish the course and go over it a few more times like your information said to see even more results. Dr. James Wesley jwesley1@nycap.rr.com, a doctor in Chiropractic medicine and biologist sent us this testimonial on January 16, 2005. I am literally tuning back into being here on earth. I’ve been allowed to see the freedom that I always had! I am trading commodities effortlessly. I’ll be relating more soon. John Quincy writes to us on January 12, 2003. Accurately predicting The Dow and S$P indices for the next day. I have been using your course for a few months now and wanted to share some feedback. I listen to the course daily and it has had a profound effect on my mental and physical body. My body feels like it is changing. It constantly pulsates or vibrates and feels like tiny electrical impulses surging all the time. This is most notable when I am lying down before I fall asleep. My diet has also changed dramatically. I used to crave and eat a large steak every day, needing the protein. However, now I rarely eat meat nor have the desire to. At this time, I eat very little, yet have not lost any weight. I have actually gained weight. My remote viewing abilities are very accurate now. As a trader, I see what the Dow and S&P will trade at the next day on a regular basis. It has been remarkable. My friends have noticed a significant change in me. They say it is hard to describe, but something has changed. Your course is really incredible and one of the best things I have done for my life. Sorry for the long delay in response as I have to meet with my interpreter to translate and type all messages. I do not read much English and I study the rv procedures in Chinese. I haven’t had time to start the RI training in depth yet, only using the golden light for energizing/healing. I am sending you separately 3 drawings (Dec 2 – 4) so they explain better the images I saw for each day. Since the last 2 weeks, I’ve further fine tuned my drawings/predictions. Now I don’t have to watch a particular screen or chart to tune into the market. I just think about it and then images will appear instantly. After that I’d rv the overall daily trend before the market opens (picture at the bottom). 10 mins after opening I would scan images for each hour of the day (pictures on top). When I get several images I would ask for guidance to select the most relevant one. When I don’t understand it’s meaning I would ask for another image to clarify until I get it. This dialogue seems to work well for me. Like you in the beginning interpretation was a bit difficult for me. Then I found out I could ask & negotiate for clarification! With more practice I can receive/interpret the images much quicker now. I find that the market is more stable between 10:30 – 11 am. I’ve also learned to ask specifically for a certain period of time say between 9-11 am. I have used lunar cycles/solar cycles & astrological charts in the past but now have stopped as I want to focus on RV technique first so not to confuse myself too much. The lunar/solar cycles are more complicated. They are good for short term market prediction, for fast movements. Usually when the moon enters the South node it indicates a rise, and North node = down. I’m still practicing to get accurate chart/figures and price range. Your vision was helpful to your friend. That was a very practical application. I suppose you might program for clarification (dreams) of dreams that you don’t understand, as I have done for the images. I will talk more about moon energies next time as I want to get this pictures to you now. When I have time I will continue to share with you my images. Please advise if you have problem opening the files. I am interested in exchanging ideas and tips with other traders who use remote viewing to forecast the markets. My goal is to be able to see the figures themselves, rather than viewing them through symbolic images, and also to influence a positive outcome with the new remote influencing course. I believe your remote viewing course would be instrumental in helping people to prosper in the financial marketplace and improve all areas of their life. I am so grateful to have discovered your program and look forward to further training (especially in Chinese!) and fine tuning my skills. Thank you, Gerald! You are doing great work. I highly recommend your course to anyone interested in predicting market trends in the stock exchange or the commodities market. Prophetic dreams and extraordinary situations happening in commodities trading while training with our RV course. Remote Viewing Commodities and Baseball games. Also Debbie judges the effectiveness of the Academy RV course versus courses of other more rigid fixed protocols originating from the US military that she has previously taken. I appreciate your time on the phone Friday. I look forward to applying your insights to my trading now. It’s really so simple. I have reported my initial experiences below. If hearing these experiences helps in any small way to inspire a potential trainee to decide to buy the course for themselves I would be thrilled. Yes, I am having wonderful and wonder filled “mind safaris”. The effects of listening to the tapes were immediate. I was empowered with joy. No other way to describe it. There seemed to be a deep part of me that was totally enjoying knowing that it no longer had to live in a fixed rigid reality making system. I don’t know how else to say it brother,…LOL! I think it was only about 2 or 4 days into the tapes I started having prophetic dreams. My dreams where showing me what was going to happen in my commodity trading when I awoke in just a very short time from now. I knew by emotions if my existing silver position was going to bring me a loss or my sugar contracts were going to bring me profit. I saw my trading result emotions before they actually happened. However, I still was not taking profits from such Remote Viewing. I was afraid to intervene on destiny. Even knowing I was to lose money by holding a position I was “frozen” into inaction by anxiety and took the loss. With profitable positions I was afraid to buy more contracts. Because I wasn’t making money from this prophetic dream type of Remote Viewing I decided I needed more information and asked for a “better deal”. I had always felt that the locals (those traders actually in the trading pits) had a better advantage because of their close proximity to the actual price waves, motions and emotions present in the trading pit. I asked that I be given specific inside information before the pits opened for trading. I wanted to know how high, how low a commodity was going to move inter day. Within two or four or so days of making the request I was in a hypnogogic meditative state you mention about on your web page and an old seasoned floor pit trader complete with trade tickets in his hand, New York hat, suit, and DEMEANOR!, appeared before me and told me what was going to happen in the coffee pit today and tomorrow. He said coffee was going to rise about 45-65+ points, then they were going to cap it, and settle lower for the day and that tomorrow it would rally. Very shortly after that I went downstairs to my computer as coffee was about to open for the day. Coffee advanced about 45-65+ points, stopped and settled lower for the day. The next day it rallied! Still I made no money. I was afraid to enter the market as things seemed to perfect. I did not trade on the information I was given! I then decided it was not my fault, I was new to all this and deserved another chance. I decided I needed even better knowledge and that if I could only see a price chart of coffee the day before the actual trading took place I could surely have the confidence to make money. Within a few nights from stating my desire, in another early morning meditative hypnogagic state, suddenly a daily price chart on coffee appeared before me showing a strong prominent spike up in price. Shortly later I went downstairs to start my trading day and I wanted to be in coffee. Coffee immediately upon opening made a strong vertical advance in price. It was my Remote Viewed price chart in perfect replication now happening in the real world. I finally felt I had to make a trade so I entered into a big trade in coffee and lost money as coffee then moved lower for the day. I was disappointed and confused. Still, I asked for a “better deal” and asked that this time the higher power choose the best method of presenting the information to me so I could understand it’s intentions . I wasn’t asking for a trader to appear, or a price chart to materialize, which ever method it felt I was best suited to understand and utilize, I would gladly appreciate. The higher power has a keen sense of humor! Within a few days in that same morning meditative hypnogagic state when your not sure if you are awake or asleep, I suddenly found myself in a downpour of cascading corn cobs. Paper corn cobs, painted and pasted together just like little children would draw and create in their classroom in a first grade school, were falling all around me. Falling on my head, falling all over me and around me. It was exciting and joyous, and rather interesting. Children’s corn cobs! I knew corn would probably have a down day and drop in price. When corn opened for trading that day it gapped down hard, and for the next two days it gapped down further on each opening! This is a traders dream! Traders pray every night for advanced information and price action like this. (and children delivered it to me) I was afraid for all three days to enter a short position as I felt it would turn against me at any time and I would lose my money. I don’t think it is possible to ask for better Remote Viewing of Probable Outcomes, and yet I could not profit from the events and actually had lost money. I RV’d baseball games for about two weeks to determine probable outcomes. Over that period of time I generated a 50% success ratio in identifying the winning team. An unimpressive record. However, there is an amazing correlate to the period. 100% of the time when I decided to RV the outcome in order to place an actual bet the very next day, I lost. And 100% of the time when I decided to RV the outcome without getting involved in an actual bet and just for fun and practice, my RV was correct. I think these results are statistically significant and I think the trading realities are all trying to point me to the underlying reality you advised me of on our phone conversation. While I have your attention and am taking your time I want to explain another thing that is happening to me. I have not finished the course on Remote Viewing yet. I have only had the course 4 weeks and listened to the first 5 tapes. I listen to at least one tape a day I feel empowered, as in joy, while listening to them. Sometimes I fall asleep listening to them. I know this sounds a little crazy … I am discovering that people are being attracted to me, and vice versa. I don’t ever recall making new friends this quickly before. People are just coming to me and wanting to be with me for no apparent reason. I’m not even gone yet and they want to know when I’m coming back. Professional people, people with chemical addictions, children. One day in the parking lot of a busy shopping center a little girl was abandoned by her friends at their school bus stop and afraid to walk home alone thinking someone was going to,.. “steal her”, actually run up to me, the complete stranger to her, and asked me to walk her home. She told me her problems, her father in jail, her mother in the street, her grandparents raising her, her mean school principal. We just talked and laughed at life together. I feel these new events are connected with what happens when a trainee learns how to,..” 1-2-3 (snap) connect to the center of your being!” The experiences are actually a little deeper than I am reporting here, but I think I should leave it to the imagination of the reader to understand the who and how. I also feel impelled to report something else to your readers and potential trainees. I know that Mr. Gerald O’Donnell states very explicitly in his course that it is his contention that there is no one way, no one path, that all roads lead to the Rome. For the record I however will report the following. I started RV about five months back using another company’s materials. I was impressed with their credentials. They stated that their remote viewing “technology” had direct lineage with the USA Top Secret Military Intelligence gathering unit known as “STAR GATE”. One of their primary corporate officers and trainers was a former military officer with direct involvement in STAR GATE when it was operating as a true RV unit within the military. Their technology was reported to be the original and pure PROTOCOL formerly existing as CLASSIFIED by the US Military . And they assured me that their Internet based training classroom was dedicated to my success. That’s all I needed to hear brother, I bought my ticket (at 6 times the price I paid for your course!). I was leaning on and hoping for RV success based on their credentials and experience and not my own. I didn’t really comprehend that I, and everyone else, already possess the innate “protocol” to RV successfully until I took your course. I did achieve some success in my RV with them and it required on a daily basis a comparatively and eminently more laborious process due to the requirement of adhering to a fixed mental protocol to approach the natural occurring phenomenon referred to as the Matrix. My experience however was that their online classroom was dedicated to my continued success only as long as I stayed within their concept of “reality”. Once my mind, filled to the brim with it’s own past experiences and accustomed to learning new topics in it’s own unique learning methodology, took me to questions which did not fit into the desired mode of their PROTOCOL, my questions were ignored by their online instructor. I was forced to either change my questions and conform to accepted protocol, or simply drop out and give up the pursuit. I did neither, I simply purchased your course which I had read about weeks earlier on your web page. I decided you were not as militarily connected to the Matrix as they were. How’s that for creating a limited universe! I passed over you because you did not offer me the mental crutch of an emphasized special secret military connection to the Matrix. You did not offer me an online classroom, and did not tell me it was going to take hard work and long time on a daily basis. In fact you were audacious enough to suggest on your web page that I could get success in as little as 4 or 5 weeks listening to a tape while in my pajamas! And besides, if I had a question about an experience when taking your course I was to just call you up and talk to you about it personally! What kind of way is that to run a Top Secret Intelligence gathering school?! LOL brother! I’ll just say this Mr. Smarty Pants,..you were wrong, it doesn’t take 4 or 5 weeks, it takes only about 4 days! I have learned since taking your course that there is no one way, no one path to the Matrix. She, he, or it is public domain. No one needs the military, military men, or a government intelligence unit to share with us or introduce us to the Matrix and our own higher Selves, they are both innate to us and very receptive to our introduction to them. The choice is solely ours as to how we want to learn how to contact the Matrix. We are already in it, be I a truck driver, mother, or 5 star general. I have learned I and everyone else already have a very direct linage to that same Top Secret Intelligence gathering unit known as “OUR HIGHER SELF”. I have learned from taking your course that I and everyone else is already an officer of this TOP SECRET Intelligence gathering unit and on a daily basis intimately involve ourselves in the responsibility of administering and DECIDING the affairs and realities of that authority and our own daily happiness. And I have learned since taking your course that the only protocol I or anyone else needs to successfully RV is to be able to think a thought! (and a good comfortable pair of PJ’s) Everything else is show business! Bob laidlaw blaidlaw@alphalink.com.au an Australian RV trainee of our academy sends us this testimonial on July 28, 2002. Adam Hamilton has a very interesting series of articles, available from his home page. I only became aware of these today when reading the article about JP Morgan’s current derivatives problems on rense.com “Headlines”. Also thanks for your valuable RV prediction of the markets. I have to take an interest in the markets as this is the source of my retirement income. My share portfolio performed well last year with 25% capital growth, which certainly beats our Australian mutual funds which all had negative returns. Currently I am 95% in cash as from July 9, 2002. On the following day, the S & P 500 head and shoulders top was breached downwards, and the Australian markets followed suit. During previous months, through my own RV and various information sources, I had become increasingly aware of and concerned about the gathering storm. It is obvious to me that your courses have been very helpful in raising my awareness of what is really going on, increasing the ability to discern the difference between truth and market propaganda, and to take appropriate and timely action. I also experienced some attacks from The Matrix, The Matrix reloaded, manifested by unpleasant physical symptoms and problems with the commuications devices I use to monitor the markets. My Teletext equipped TV , my fax machine, and data download service for computer analysis, all had serious malfunctions within that week ! This indicated that I was on the right track, so instead of confusion and panic, I took the opportunity to replace this equipment with better performing units. I also agree with your advice and predictions regarding the housing market, also in a bubble top in Australia, and that your students should take action to eliminate debt, become more self-sufficient, and overcome negative emotions of greed and fear. There should be wonderful opportunities in the future for those people who have been proactive and are patient enough to wait for the market bottom. Finally, I really look forward to reading new messages or insights you are being given while at the Delta level, so I wish you had time to have a weekly spot on your Web sight for such messages. Thanks for all you are trying to do for your fellow man and this world. L. Fallon ( Remotes@att.net ), a very successful graduate, writes to us this comment on August 07, 1999. Heighten RV and intuitive trading abilities after taking our course. Thanks for taking time out to talk on the phone with me today. I first wanted to write this letter to you to say how much I enjoyed the course…all six tapes were wonderful. The most intense experiences for me were two. These were when I went to a future time and also when I worked with a human person on tape 6. Each session was unique for me. I have learned that I can remote view easily and effortlessly with the methods you’ve outlined in the course, and that has been a positive feedback in and of itself! I do believe I am even more of an ‘intuitive trader’ than ever before. John Kuder (jkuder@earthlink.net), a recent trainee, wrote to us the following feedback on July 27, 1999. Improved financial trading abilities after taking the course. Private training. I have recently finished your remote viewing course and have found it to be a very satisfying experience. While I have not had profound experiences like one of the other students seeing dinosaurs, I did not approach the course looking for clear remote viewing. I was looking for what you describe in the traders section, “… to immerse oneself within the stillness of the eye of a storm of mass psychology where greed (desire for money) and fear of monetary losses are the main forces that swirl markets around. Up and down.” To trade from the calm, oneness of deep theta. To that end I have continued to listen to tape 6 to increase my ability to go quickly to deep theta, even with my eyes open. I find I will need to continue to practice this, but I am getting good results for a beginner. My trading has improved since I started the course. I have found the best time to listen to the tapes is in the morning, after getting up for a few minutes to get fully awake. Since I am rested, I do not tend to fall asleep during the tapes and the session puts a nice glow around me that lasts through the day. My wife has noticed me being generally calmer. I also had a private session on the phone with your associate. That was a remarkable experience that I am still discovering the effects from. I can say that it met my goals and I plan to do others. Thanks for your help and please get the other courses finished ASAP. I want more. James Wesley (wesleyjd@worldnet.att.net) a former trainee, who is a health professional and a part-time trader sends us this feedback on April 08, 1999. Very special experiences and life changes following our RV training course. I wanted to let you know how I was doing with your R.V. course. In short, beyond all expectations! Most recently, I went RV’ing the crucifixion. Words are far to inadequate to relate the emotions I experienced. I really felt a physical warmth that was emanating from Mary, the Holy Mother. I believe that I have been in rapture ever since. But before that I thought I had already experienced many levels of explosive improvements in my progress after what seemed like painfully long periods of “plateau” (not progressing). Each new level felt like I had really gotten the intended message of the former one. Now I realize how far I have to go, and when the time is right the next step will become evident to me. I have only been learning for 8 months. Initially, I felt that in 2 or three months I’d “be there”? Well I now see so clearly that it’s a process that takes steps, as only each person can delineate for there own, how and when each evolution takes progression. All things in their proper season. My trading is now effortless. I am either winning or not trading. I am a day trader that uses a system that sometimes can give 30 signals per day. However, that is no longer the case. Somehow, the more I let go and relax, the more it seems clear when and when not to take a trade. Also every aspect of my life has become so effortless! What used to seem like insurmountable tasks are now not much more trouble than breathing or making the heart beat. In essence, if it’s right it’s unencumbered by any means. Time has lost almost all value. I would find it hard telling the teacher that it’s not important that my kids did or did not get on the bus at 7:45am but somehow inside me I know that if I did that would be fine too. Occasionally I have to testify in court as an expert witness. This used to be an unimaginably painful experience at lawyers cross examination – but now they seem to start there “grilling”, look puzzled, and just stop! I feel all this is due to you giving me the opportunity to learn deep truths, through the R.V. course. Thanking you seems inadequate but that seems appropriate at least for you kindness. I try to go to theta early 6:00am EST every day, to start the day off correctly and often do it at many more occasions. Let me know when you have more advanced courses available. I know that my greatest levels are yet to come perhaps even full illumination of the crown chakra. That is a dream I have had for many years. Perhaps it could be. Jerry Bell (jerryleebell@hotmail.com) , a new student writes to us the following on March 22, 1999. Experiencing the transcendental light-consciousness and its after-effects. While on my second session with tape 2 side A, I had a powerful, uplifting and life altering experience at the point where one is instructed to send out loving emotions to the Universal Mind and to wait for a response. I must say that I did expect to get a response; however, what happened went far beyond what I had expected! I sent out love as instructed, and a few moments after that I was engulfed in light and almost completely overwhelmed by a sense of love, peace and happiness. This light was brighter than any light I have ever seen. Even the sun, when looked at with naked eyes, could not compare to it! I, for a moment, somewhat lost the sense of having a physical body. This event has definitely changed forever my life in the way I see the world and the beings that populate it. Most of all, it has changed the way I see myself! The next day, I began what was my third session on tape two side A. I was brought to the level of deep alpha as I approached this level something began to happen! My sense of being changed. I felt as though I was pure energy. The atmosphere around me seemed to be dark blue and also a form of energy. It also had what appeared to be tiny bursts of energy that were like flashes of white light. Soon thereafter, I felt my self spinning. It was as though my being was composed of two distinct fields of energy: one on the outside, and one on the inside. The one on the outside turned counterclockwise, and the one on the inside swirled clockwise. Then, suddenly, the swirling started to happen in the opposite directions, and then went back as in the first phase. That was an extremely powerful experience. After the session ended, I was left with a tremendous feeling of clarity of mind. Since then, my thoughts are much clearer than before. I also have had the mental shift that you spoke about. It feels as if my mind is focused alike a laser beam and when concentrating on a target, I get a lot of information, even the thoughts of others. But it seems that they change so fast that I cannot keep up well with the pace of change. Yesterday, a buddy of mine asked me if I could locate by remote viewing his car that had been stolen. I kept still and concentrated on the incoming information for a while, and described to him that I saw his car parked in front of a gray hotel in town. He knew of a hotel matching the description; went there, and to his great surprise, did find his stolen vehicle exactly as I had described it to him. WOW! During the session on tape 2 side A, one learns to go to deep alpha and deep theta and, as one has learned to do so, he or she then remembers the sensation of getting to each level. So that, when one returns to these levels while, for instance, remote viewing, one can feel the shift physically and mentally. It is like having indicators. When I go to deep alpha, I have vibrating sensation on top of my head. When I go to deep theta, I get this soothing feeling on both sides of my head at the temple areas. Since I began my training, my desire to smoke is fast fading away. My sense of self-awareness has increased tenfold. I feel stronger and need less sleep than before. I also have a deeper sense of calm. My body feels much lighter. I have less hunger, and now prefer vegetables, fruits, and milk to processed bread. Another thing I also noticed is that I was able to predict the historical high for the DJIA. Remember the 10,000 mark!!! That was the highest the DJIA had ever been in history. I must admit that taking this course is the most wonderful thing I could have ever done for my self. I can’t wait to go to higher levels! Donald Vecchiolla ( automan@westnet.com) sent us this follow-up feedback on February 03, 1999. Trading the S&P index with the help of the tools provided in our RV course. I just wanted to pen you a quick note and a thank you. As you know, I am a full time S&P trader. I have been listening to your tapes for over three months now. William J. Sneller ( sneller@home.com ), one of our trainees, sends us on December 31, 1998 this feedback. His gratitude at acting upon our warning of violent Stock markets corrections predicted for the period of the late summer of 1998, and posted on our home page in April 1998 following RV premunitive information received by our remote viewers. I would like to include a brief testimonial regarding my experience with heeding your April ’98 public service announcement. To that effect, may I first say thanks! Your warning of a violent stock market correction enabled me to employ a strategy that prevented considerable personal loss. Many were less fortunate. Though I passed on the possibility of this threat to my investor friends & colleagues, not all were willing to consider the advice without mainstream validation. I commend you for sharing this information with the general public. Donald Vecchiolla (automan@westnet.com) comments on September 23, 1998. Training with our RV methodology with a primary emphasis on financial trading. I am writing to let you know how pleased and satisfied I am with your course. It is refreshing to deal with someone who is honest, helpful and knowledgeable. I appreciate the promptness of the way you returned my phone inquiries and the solutions you provided. I am impressed with the depth and breath of the knowledge you have demonstrated to me in our dealings. Your tapes are very easy to use and proved to be very effective for me in my trading. I do feel the course is a potent tool for all traders. I am a pleased customer and would recommend your services without reservation. Donald Vechiolla ( automan@westman.com ) uses our RV training to improve his financial trading and sends us this feedback on September 16, 1998. Use of precognitive intuitive information in trading the S&P future contract. I am a new student of yours for a little over a week. I am a full-time trader. I cannot say enough about your material. I do hope you do put together course #2 for trading soon. I want to be the first to purchase it. Keep up the good work. Just a note to let you know how things are coming. I am on tape 3 side B now and have not experienced RV in a visual manner but have felt/known very exact numbers in the Futures market. Today, for instance, I felt at the opening that the high in Crude Oil would be $15.39 and the low $15.13. On the open, the price went down to $15.11 from $15.28 and then rebounded to $15.36. Then traded around $15.22 all day. I then asked myself the close for crude. I felt $15.09. I just checked it. The price went to a new low of $15.09 before closing at $15.12. Pretty good estimates! Yesterday, I felt that a crude low price to trade would be $15.38. Most of the day the low was $15.36. Halfway through the day, I asked myself to see the high and nailed it at $15.58: the exact high of the trading session! Then the price trashed back to $15.28 at the close, whose price I had not asked to see. Similar predictions have been coming, and they seem to be getting more accurate and meaningful. I have had only one day out of five or six in which the numbers I felt/knew made no sense at all. The rest of the time, the specific numbers came to me, which then popped up latter in the day and would have been very useful to me had I traded upon the information I received. I plan to stop paper trading soon and start real trading if this continues. I am really convinced that there exists a river of information. I continue to pray for God’s will in these matters. So far, there has been no negative feelings along that line. I do believe that God reveals truth to each of us. Mr. Kerry Clark ( kclark@prismnet.com ), one of our successful graduates, had sent us previously the above testimonial. After receiving many queries and graciously answering them personally, he asked us (January 1998) to post seven inquiries and his respective answers to them that he feels should preempt most of the questions he gets. He hopes that this would ease him from the burden of repeatedly responding to these frequently asked questions. The Academy of Remote Viewing wants to categorically state that Mr. Clark is not in any way associated with it, either directly or indirectly, and that his answers are but purely his opinions that he voluntarily decided to release. The identity of the individuals that queried Mr. Clark about the RV course should remain private. (2) blackjack and an IQ within the top 1% (British Mensa) and recently a coaching web site. I, however, could not read until 9 years. I am very interested in visualization and wonder if you could tell me if ARV is a realistic proposition for the type of results talked about vis a vis Futures or Stock Market forecasting. in fact I’d humbly be very grateful for any feedback at all before enrolling at this Academy. Nice to have your note. I looked at your website. Congratulations on a really interesting presentation. Whether you employ the wonderful tool of visualization in an active or a receptive way, I think the O’Donnell course has much to offer you. Besides specific training in techniques of Remote Viewing, the course will give you some very pleasant and effective ways to quickly enter the Alpha and Theta levels where any kind of visualizing will work most powerfully. It seems that an overall accuracy of around 80% is within the reach of most Remote Viewers. That would certainly put one ahead of the game when it comes to planning investments. I like to look at commodities with RV. In that case, all one may want to know is whether a given commodity is going to move up or down in value. It’s a very simple target. Tape 5 in the O’Donnell course will tell you quite a lot about the use of RV in finance. By the way, with careful interpretation of results, a team approach to RV can raise accuracy to nearly 100%. In our daily lives, we are used to concentrating and applying effort to make things happen. In RV you relax and mentally step out of the way so that the desired thing can happen by itself. During an RV session, your job is to contact the target, then simply observe and try not miss anything. I’m telling you this because I suspect that RV is more passive in nature than the activities I saw described in your website. Understanding this difference beforehand may prevent some delays as you undertake Remote Viewing – assuming that you’re going to. Mind you, there’s nothing there that runs counter to what you’re already doing — it’s just different, that’s all. It will help to know that. Good luck with everything, Steve. If you get Gerald O’Donnell’s course, I would like to hear of your experiences. Richard Patenaude ( patenaude@earthlink.net) wrote on November 20, 1997. Thank you for taking the time to write your detailed response to my inquiry. It is very much appreciated. By the way, while trading on Friday, I did use what RV capability I currently have to go against a technical signal to trade. As it turned out, I was correct in deciding not to trade at that particular point. I was very pleased about that. I look forward to sharpening these skills to an even grater extent. Again, thank you for making these materials available to the general public. Much good will come out of it. Richard Patenaude ( patenaude@earthlink.net) wrote on November 22, 1997. Thank you for your message. You may include my e-mail address if anyone would like to contact me with any question they may have. I look forward to any additional material and training. Today, I called the S&P twice right on the nose even though it went through my numbers to a higher high. I expect with more training, I’ll be better equipped to call the exact high for the day. My wife and I have read the Celestine Prophecy material and felt your course was very much in line with the vibrational evolution spoken of in the books. Your tapes open up a whole new world for me that I knew existed but didn’t previously have access to. I look forward to the personal growth this will afford me.